The markets close in 10 minutes. It was a good day. I'll review the week tomorrow. For now -- go do something else. Merrill Lynch (MER - Cramer's Take - Stockpickr - Rating) said third-quarter profits will be wiped out by a huge writedown tied to this summer's credit crunch. The New York-based brokerage firm said it expects to lose 50 cents a share for the quarter, reversing the year-ago $2-a-share profit and falling well short of analysts' $1.24-a-share profit forecast. Merrill will take $4.5 billion in writedowns on its holdings of collateralized debt obligations and subprime mortgages. It will also write off $967 million worth of leveraged lending commitments. WaMu, the nation's largest savings bank, reported net income of $748 million in the third quarter of 2006, meaning third-quarter 2007 net income is likely to be somewhere around $187 million. The decline in third-quarter income will mostly come from rising provisions for loan losses and write-downs of mortgages Washington Mutual currently holds. The XLF was a mess after the mid-July sell-off. Volume spiked and the index moved below the 200 day SMA which is a bearish signal. Now the 10 and 20 day SMAs are all moving up. The 50 day SMA will probably join the SMAs by moving up sometime over the next few weeks. However, the index is still below the 200 day SMA. We'll need to move above this level before even thinking about a recovery in this sector. Both the broker dealer ETF and the Insurance ETF have the same characteristics as the XLF ETF regarding their moving averages. However, both of these ETFs are trading above the 200 day SMA. That's a good sign. But with the latest news coming out of the BD sector these sectors have some big problems coming down the pike. 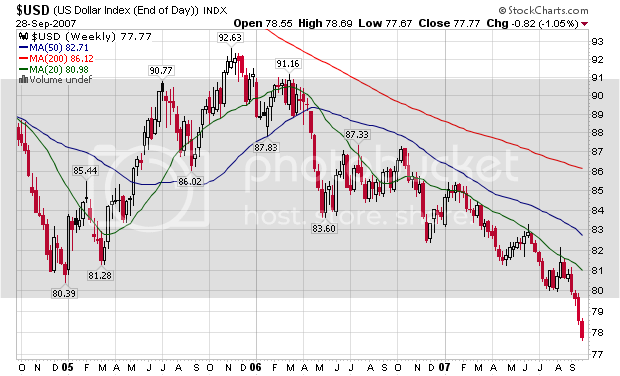 Regional banks have the same problem technically as the XLF in they are still trading below the 200 day SMA. Clearly a bearish problem. 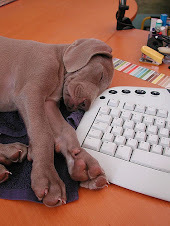 The news from the financial sector this earnings season has been terrible. However, my guess is traders are looking at all of these announcements as one time events that won't be repeated next quarter. There is still an underlying assumption that we won't have any more problems in the credit markets -- that everything is AOK. I'm not sure that is a correct assumption. There is a ton of debt out there backed by sub-prime mortgages and we still have a year and half of resets to go through. In other words -- there is still plenty of reason to be concerned. Employment rose in September, and the unemployment rate was essentially unchanged at 4.7 percent, the Bureau of Labor Statistics of the U.S. Department of Labor reported today. Nonfarm payroll employment rose by 110,000 following increases of 93,000 in July and 89,000 in August (as revised). In September, health care, food services, and professional and technical services continued to add jobs, while employment trended down in manufacturing and construction.Average hourly earnings rose by 7 cents, or 0.4 percent. Payrolls grew by 110,000 after an 89,000 increase in August, the Labor Department said today in Washington. Revisions added 118,000 workers to payroll figures previously reported for July and August. The devil's in the details, so let's see what the inside story of this number is. This shouldn't surprise anyone. The housing sector has been dropping like a stone for the last year. While commercial construction has helped to absorb the displaced workers, that will eventually only go so far. It looks like we are at the point. As for manufacturing, the main issue here is the productivity increases we have seen over this expansion. Although exports continue to rise, this is occurring with fewer and fewer workers. 71.81% of the jobs created (44,000 + 35,000) were lower paying. In addition, when we take government out of the equation (which gives us 73,000 total), pretty much the majority of jobs created is lower paying. Personally, I'm unimpressed by these numbers. However, the upward revision to last month's numbers plus this months headline number will probably give the market some upward momentum. Today's action was, well, pretty boring. Traders area waiting for tomorrow's employment report. We still have a consolidation pattern going on with the SPYs. There are a couple of other interesting charts from the market that I think deserve some attention. 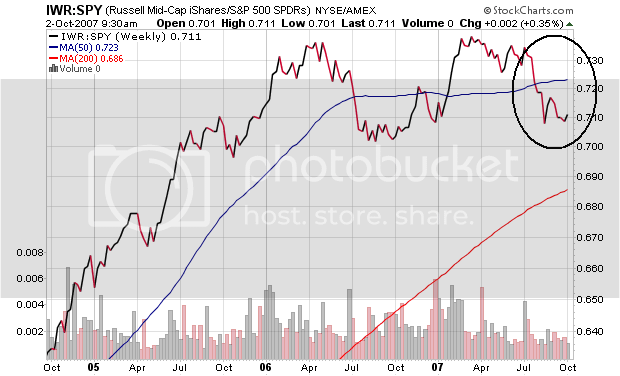 This is a year long chart of the oil ETF (USO). Notice the market rallied from June to August, then sold-off to the 61.8% Fibonacci level. The August sell-off was the combination of simple profit taking and and end of the summer blow-off. But since market "bottomed" in mid-September we've had a nice run. I included the Fibonacci levels for possible price targeting on the downside. The mid-caps (IWR) and small caps (IWM) have the exact same trading pattern as the SPYs. Both of the above averages are cautiously moving up. They've had strong ups days followed by meandering action towards a moving average. These are not the strongest types of up moves we could expect. If the employment report is positive, this is where the action will be tomorrow -- the large caps. They are already outperforming the mid and small caps. In addition, they are resting near highs just waiting for some reason to move higher. Here is a two year chart of the GLD ETF. Notice the following. 1.) The ETF created a very strong triangle base for the six months from the beginning of March to the beginning of September. 2.) Prices are currently trading around the high established in early May 2006. This is essentially a price consolidation. Here is the three month chart of gold. It simply gives us more detail about what has happened. I included Fibonacci levels in anticipation of a pullback. The index has advanced sharply from it's base, so a pullback wouldn't be surprising. 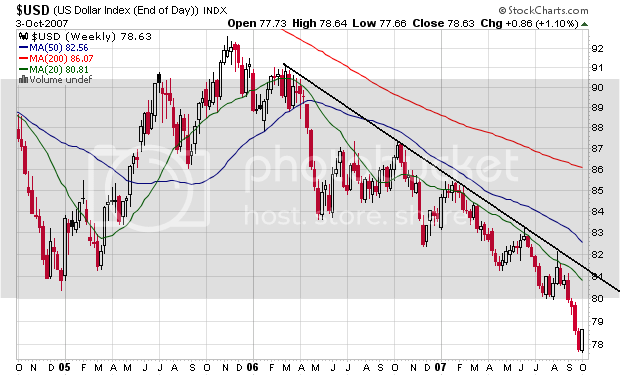 In addition, the index hasn't made a strong move above the 2006 level. My guess is the market is treading water waiting for more confirmation from the Fed about policy. In addition, we're getting very mixed inflation numbers right now. While the official BLS statistics are OK, food and oil inflation is very much a possibility. Orders placed with U.S. factories fell in August by the most in seven months, raising concern the turmoil in credit markets eroded business confidence. Bookings declined a greater-than-forecast 3.3 percent after a revised 3.4 percent gain in July that was smaller than previously estimated, the Commerce Department said today in Washington. Excluding transportation equipment such as cars and airplanes, demand declined 1.7 percent after a 1.7 percent gain. The figures suggest business investment will slow in the second half of the year as a worsening housing recession hurts consumer spending. Economists project Federal Reserve policy makers will lower interest rates again to prevent economic growth from stalling. ``The volatility in financial markets in recent months probably introduced an element of caution in ordering,'' said Michael Moran, chief economist at Daiwa Securities America Inc. in New York. This news shouldn't be that surprising considering the credit markets over the last few months. The real concern is what will happen over the next few months. If we see this trend continue, then we have a problem. The Saigon Times said this morning that the State Bank of Vietnam was abandoning the attempt to hold down the Vietnamese currency through heavy purchases of dollars. The policy is causing the economy to overheat, driving up inflation to 8.8pc. Vietnam, which has mid-sized reserves of $40bn, is seen as weather vane for the bigger Asian powers. Here is a chart of the dollar over the last two years. For those of you who want a perfect example of a bearish chart, here it is. Notice the following. 1.) The trend is clearly downward. There is a very solid and distinct downward sloping trend line that connects all of the peaks. 2.) The shorter moving averages are below the longer moving averages. This will bring the longer moving averages continually lower. 3.) All of the moving averages are trending lower. 4.) Prices are below the moving average. This will drag all of the moving averages lower. In other words, every element on this chart is bringing prices lower. At the same time, here is a chart of the Euro index which is the exact opposite. Notice the following. 1.) All of the moving averages are heading higher. 2.) The shorter moving averages are above the longer averages. This will bring the longer SMAs up. 3.) Prices are above the moving averages. This will bring all of the moving averages up. 4.) 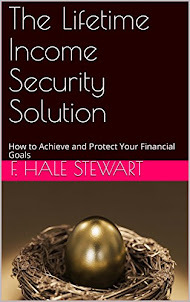 There is a clear trend moving upward that connects the lowest points on the chart. The dollar's value (or lack thereof) was a primary reason I argued the Fed shouldn't cut interest rates. 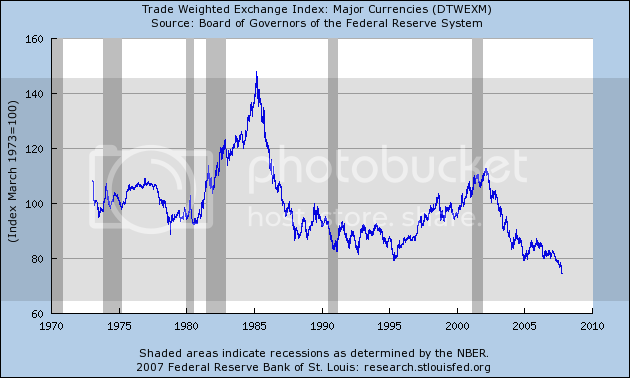 Here is a trade-weighted average of the dollar going back 30+ years. Notice we are now at or near the lowest point in that time. 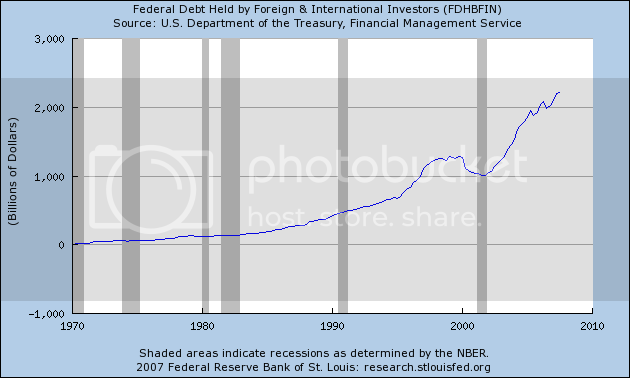 Finally, here is a chart of total US debt held internationally. Notice the large increase over the last 7 years. Let's tie all of these ideas together. 1.) The US is increasingly dependent on foreign financing. 2.) At the time the US is more dependent on foreign financing, the dollar is at or near it's lowest point in more than 30 years. 3.) The Federal Reserve just lowered interest rates, making US assets less attractive to foreign investors. 4.) Number three leads to a decrease in value of all the US assets held abroad. 5.) Investors don't like holding assets that are dropping in value. Yesterday I noted the markets may be in the same pattern as they were about a week and a half ago. Then the markets made a big jump followed by a meandering move until the average hit the 10 day SMA. So far we're repeating that pattern. We jumped a few days ago and have drifted since. However, the lack of a convincing follow-through after Monday's jump should raise some eyebrows. On the five day chart notice we have two possible triangle consolidations. Also note the average traded to the 38.2% Fibonacci level and used that level as a center of gravity. The QQQQs -- which have been performing well lately -- may have broken their upward trend today. This shouldn't be surprising. My guess is some traders are ready to take some money off the table and this may signal it's time to do just that. Large cap stocks have been heading lower for the last few days. Yesterday I posted a relative strength chart comparing the large, mid and small cap stocks to the SPY and the large caps were definitely the best performing. Over the last few days my guess is traders are again taking some profits off the table. The transports still haven't confirmed this recent rally. Morgan Stanley said it is firing about 600 employees in its residential-mortgage businesses. The cuts, which primarily affect sales and administrative staff, account for about one-fourth of the New York investment bank's home-lending work force, said a person familiar with the plan. Morgan Stanley, which last year paid $706 million to buy mortgage-lending and servicing firm Saxon Capital, said about 500 people will be fired at its three mortgage units in the U.S. and about 90 at Advantage, its United Kingdom home-lending unit. Zurich-based Credit Suisse will cut 170 positions. Last month it cut about 150 residential-mortgage jobs. Most of the latest cuts will be made in the commercial-mortgage-backed securities area, a spokeswoman for the bank said. "In the current market environment, we have made targeted reductions to adjust our capacity to meet diminished client demand," the bank said in a statement. The announcements follow layoffs of hundreds of residential-mortgage employees at other securities firms and likely presage even broader cutbacks at many investment and commercial banks. (Meanwhile, Countrywide Financial Corp., the nation's biggest home-mortgage lender, has launched a campaign to shore up its image. However, there have been a ton of lay-offs since the mortgage mess started to worsen at the end of last year. 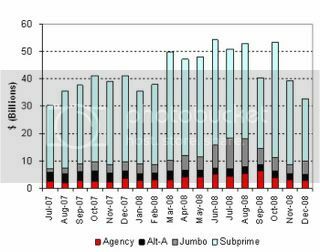 According to the mortgage lender Implode-o-meter 161 major US lending operations have "imploded". Yet over this time, financial service jobs have continued to increase. How long can that trend last in the current environment? General Motors Corp., the No. 1 U.S. auto maker in terms of volume, posted a 0.28% sales boost during the month compared to September 2006 despite a pull-back in sales to fleet buyers, such as rental-car companies. GM got a lift from a host of new products, including large crossovers such as the GMC Acadia, and tactical sales incentives on pickup trucks and large sport-utility vehicles. GM shares rose $1, or 2.8%, in New York Stock Exchange trading to close at $37.05. Ford Motor Co., however, suffered a 21% decline in sales, as slumping demand for truck models such as the Explorer SUV and the F-Series pickup offset more robust sales of new crossover vehicles such as the Ford Edge. Still, Ford shares rose on the Big Board to close at $8.57, up 4.1%. Toyota Motor Corp., now No. 2 in the U.S. market, suffered a 4.4% decline in sales, as sales of Toyota brand SUVs skidded 9%. Among other significant players, Chrysler LLC said sales fell 5.4%, while Honda Motor Co. reported a 9.4% increase in sales, powered by a 27% jump in sales of the Accord sedan, including a redesigned Accord introduced early in the month. The overall seasonally adjusted annual rate of sales equaled 16.23 million vehicles during the month, according to Autodata Corp. The result was reasonably better than many analysts and auto-company officials had been expecting, after August's relatively weak showing. 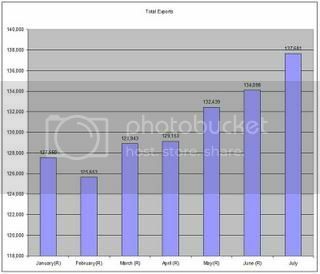 But the latest sales pace was still well below the trend set over the course of the decade and into the early months of this year. Most analysts now expect total light-vehicle sales in 2007 to crawl to 16 million vehicles, well below the 16.7 million rate that is generally considered healthy. These are terrible numbers and show the consumer is still pulling back. It makes me wonder about the strength of last month's durable goods personal consumption expenditures which showed a strong increase. This was despite the drop in home and auto sales. Deutsche Bank AG Wednesday said it will take charges of up to 2.2 billion euros ($3.09 billion) for the third quarter on leveraged loans, structured credit products and mortgage-backed securities, although it will still achieve a sizeable net profit due to one-time gains. The German banking giant said the charge on leveraged loans and loan commitments will be up to €700 million, in addition to charges taken on such loans and commitments during the second quarter. It will also take approximately €1.5 billion in charges on structured credit products, residential mortgage-backed securities and valuation losses on both debt and equities. The story goes on to note that DB will have a profit because of other activities. I am now very curious about what those activities are. In addition -- this is the third large investment bank that has taken a big hit to third quarter earnings because of the credit market situation. The market rallied on the last announcement. Maybe this is food for a further upward move in the markets. I'm going to start with the daily chart today because the market may be entering a trading pattern of sorts. Before yesterday's rally, the market had been "bumping and running" along the 10 day SMA. The market would make a big gain and then trade sideways until it hit the 10-day SMA again. 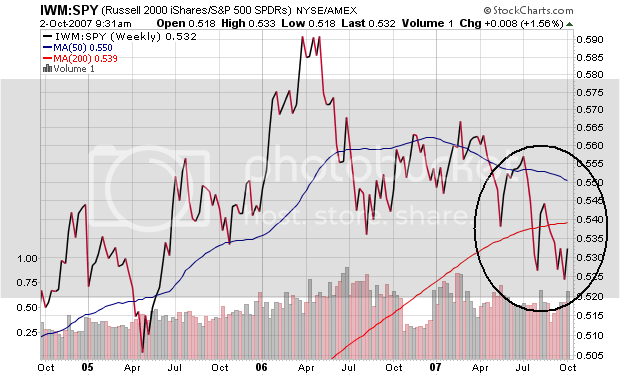 On hitting the SMA the SPYs would again rally. As the daily chart shows, today we had a "breather" -- the market treaded water after yesterday's advance. On the 2-day, 5-minute chart you can see the market closed very near the open. On the 5-day chart pay particular attention to the Fibonacci levels. The last time the market advanced and then traded sideways it used the Fibonacci levels for support and resistance. While past performance is not a guarantee of future performance, it is important to know what happened because this might shape traders decisions over the next few days. 3.) Pending home sales are at an all time low. Yet the market either rallied or stood still on this news. 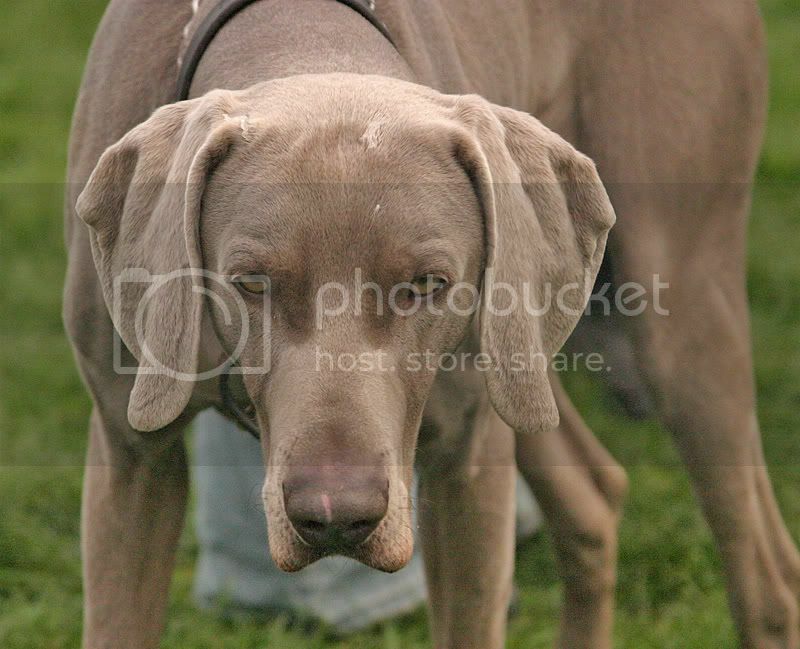 All of these negative events give further ammunition to traders who are betting on another rate cut. Hence, the implied floor in the markets. The National Association of Realtors' index of signed purchase agreements fell 6.5 percent from the previous month, the group said today in Washington. The decline was more than economists anticipated and pushed the measure to the lowest level since the organization began tracking purchases in 2001. The gauge plunged 11 percent in July. Higher credit costs and lending restrictions after the collapse in subprime mortgages may push the industry downturn well into 2008. The Federal Reserve will probably need to make further cuts in interest rates to keep the broader economy expanding, economists said. Here are three charts that compare the S&P 100, the S&P midcap and the Russell 2000 to the SPY, respectively. What we're looking at here is the relative performance of each of these indexes. By far the biggest winner in the post-July credit market problem environment is the S&P 100 or the big cap stocks. Traders are betting that larger companies will outperform the market. This tells me a few things. 1.) Traders are looking for some safety right now. That means there is still concern about the underlying fundamentals. The soft-landing scenario is a good game to talk about, but the action of the dollars is the more telling statement. 2.) My guess is traders are thinking that these companies have more foreign exposure. This means the falling dollar is playing into trader's strategy right now. How Healthy Are the Credit Markets? While indexes of derivatives that measure the risk of default show increasing investor confidence, the difference between the interest that banks and the U.S. government pay for three-month loans is wider now than a month ago. That's a sign the Fed's Sept. 18 rate decision has yet to persuade bondholders that lower borrowing costs will stop ``disruptions in financial markets'' from hurting the economy. ``The reality is the fundamentals haven't gotten any better, and, if anything, they've gotten worse,'' said Mark Kiesel, an executive vice president at Newport Beach, California-based Pimco who oversees $85 billion in corporate bonds. About three-quarters of 30 fund managers who oversee $1.25 trillion expect a hedge fund or credit market blowup in the ``near future,'' according to a survey by Jersey City, New Jersey-based research firm Ried, Thunberg & Co. dated Oct. 1. In addition, the Bloomberg article makes a crucial observation: the difference between the interest that banks and the U.S. government pay for three-month loans is wider now than a month ago. That means the risk associated with short-term bank loans is increasing, not decreasing. That's a huge story because it indicates investors are still concerned about a credit blow-up. The U.S. commercial paper market is shrinking. The amount of debt outstanding that matures in 270 days or less fell $13.6 billion the week ended Sept. 26 to a seasonally adjusted $1.86 trillion, according to the Fed. It's down 17 percent in the past seven weeks. Mortgage paper use to be very liquid. I use to trade in it. The thought of not being able to find a bid is well, really odd. Considering the news yesterday that Citigroup and UBS have major write-downs caused by mortgage-related paper, it seems extremely premature for the markets to be saying "all is well". In addition, consider this table from the Bank of America (courtesy of Calculated Risk) that shows the reset schedule for ARMs. In short -- one rate cut does not mean everything is OK.
Citigroup Inc. and UBS AG warned they suffered significant loan-related losses in the third quarter, becoming the latest and biggest banks to reveal huge ill effects from the spike in mortgage defaults and freeze-up in the credit markets. What a difference a weekend makes. All last week I was complaining about the market because it traded up at the open and then didn't follow-through during trading. All of that changed today. The market opened higher and then followed-through. At the opening I thought the news from UBS and Citigroup would sink the market. However, Citigroup recommended the homebuilders today, attempting to call a bottom in the group. The slower manufacturing growth in the ISM report gave traders hope of a further rate cut. The daily SPY chart shows some good movement. 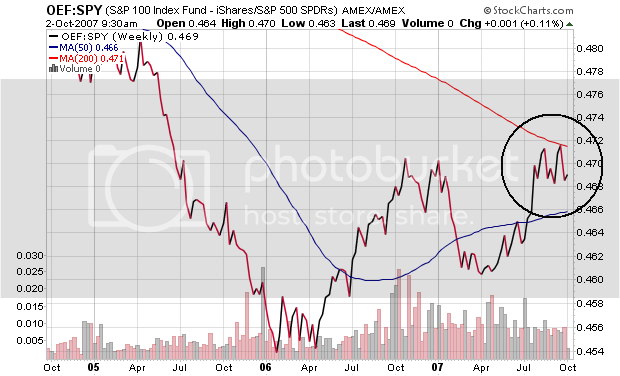 First, notice the index has traded off of the 10-day SMA 4 times since the market hit bottom. This is called a "bump and run" pattern" because the price continues to move up and bumps into a particular trend indicator for support. In addition, last week's small candles have now become a base for further upside movement. That's what I was referring to at the beginning of this update when I said "What a difference a weekend makes." Last week's bearish candles looked like a topping pattern at the end of the week. Now they're a base for further upside movement. The QQQQs continue to move upward. The trend is firmly in place. The report was issued today by Norbert J. Ore, C.P.M., chair of the Institute for Supply Management™ Manufacturing Business Survey Committee. "Manufacturing growth continued in September while some sectors of the economy are apparently struggling. The trend is toward slower growth in manufacturing as the rate of growth in both the New Orders Index and Production Index slowed. The sector is apparently in excellent shape with regard to inventories as the Inventories Index fell to 41.6 percent, indicating significant inventory liquidation, and the rate of growth in the Employment Index increased slightly in September. Overall, September looks like a good month for manufacturing." My personal favorite part of the survey is the anecdotal evidence. My assumption is the group outs in statements that are representative of a wide swath of answers. Three of four of the comments were neutral (at best). This report has fueled speculation for a rate cut which is driving stocks higher as of this writing. Mr. Bence is one of the people benefiting from one of the few bright spots in a slowing U.S. economy. While a weaker dollar hurts consumers by raising the price of imported goods, it also is helping the economy stave off a deeper slowdown, by making U.S. exports more competitive and influencing more foreigners to visit Disney World or the Statue of Liberty. First, here is a graph of exports for this year. Notice they are clearly in an uptrend. Also note the size of exports could be enough to sway the country away from a recession. At the end of 2006, total US GDP was $13.392 trillion and total exports were $1.446 trillion, or 10.79% of GDP. If the dollar falls too far and too fast, it could spur a run-up in interest rates and shake the stock market -- which would be bad for the economy. A rapidly falling dollar would raise the price of imports, stoking inflation, and in an extreme case could prompt foreign investors to dump U.S. bonds, pushing their yields higher. But as long as the dollar's decline is gradual, most economists see it as a modest plus overall. Joshua Feinman, chief economist at Deutsche Asset Management, wrote in a recent note to investors that the export upswing is one of the factors "poised to help cushion the impact of the housing correction." Real exports have grown faster than real imports for nearly two years, notes Mr. Feinman, and he expects this trend to continue. U.S. exports rose 2.7% to a record $137.68 billion in July, according to the Commerce Department. Mr. Feinman estimates stronger exports have contributed a half percentage point of added growth to gross domestic product since 2005. Notice the dollar chart indicates the dollar is falling gradually and has been for the better part of the last year and a half. That is good news for the economy because the devaluation is controlled. The problem with the current situation is the dollar is vulnerable to a random economic shock or event that could send it tumbling lower which would have very negative implications for the economy. In addition, most of the world's commodities are priced in dollars. This means a falling dollar implies an upward bias in commodity prices which fuels inflation. Swiss banking giant UBS AG, which recently ousted its chief executive in the wake of losses at an in-house hedge fund and defections of top investment bankers, plans to write down as much as 4 billion Swiss francs, or $3.41 billion, in assets, including securities tied to U.S. subprime mortgages. The big write-downs will make UBS one of the highest-profile casualties of the recent turmoil in global credit markets and raises questions about the management of its securities business, especially its expansion into the U.S.
Citigroup Inc., the biggest U.S. bank, cut its third-quarter earnings forecast, citing ``weak performance'' in fixed-income credit markets and writedowns on leveraged loan commitments and mortgage-backed securities. Citigroup expects to report a decline in net income of about 60 percent from the same period a year earlier, the New York- based bank said today in a statement distributed by Business Wire. The Financial sector is approximately 20% of the S&P 500. However, this sector is still trading poorly. 1.) The XLF is trading below the 200 day SMA and has been for almost two months. Trading below the 200 day SMA is traditionally considered to be a bearish indicator. 2.) 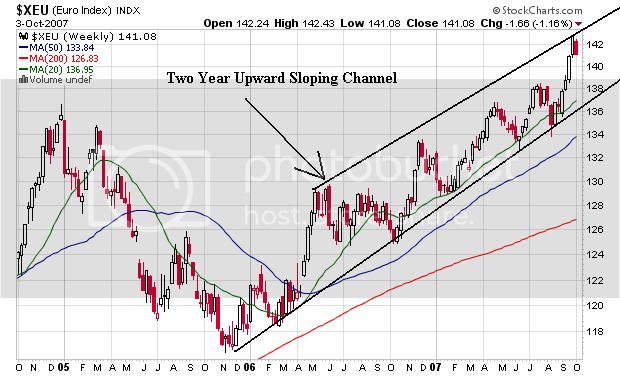 There is no discernible uptrend in the price action. 3.) There is some possible good news in he 10 and 20 day SMA, as both are trending up. However, these are not strong uptrends in either SMA. Short version -- the financials look terrible. Considering this news from UBS, I would expect this sector to look terrible for the foreseeable future. It's Sunday. I'm engrossed in USA's Criminal Intent"athon". I'll be back tomorrow.